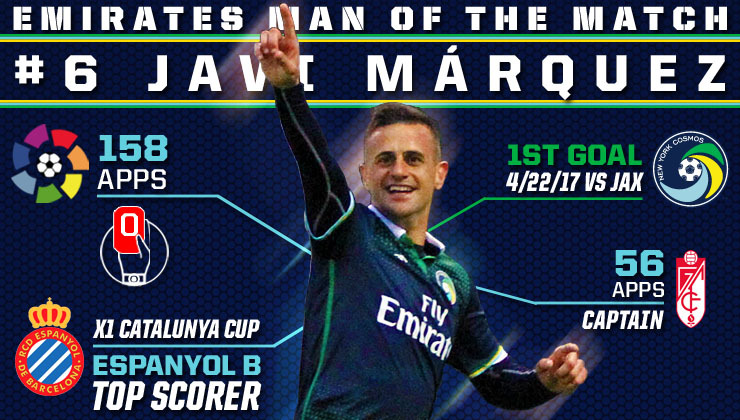 Javi Márquez captured his first ever league goal for the New York Cosmos in the 1-1 draw against Jacksonville Armada FC. The Spaniard joined the club in February, after spending most of his career in La Liga, having a total of 158 appearances in the Spanish League. Márquez gave the Cosmos the lead in the 22nd minute after midfielder, Walter Restrepo, made a run down the left side of the pitch to find the Catalan, who placed a perfect shot to beat goalkeeper, Caleb Patterson-Sewell. This was the first goal Jacksonville conceded all season. The midfielder has started three games this season and leads the Cosmos with eight total shots. The superb goal landed the midfielder accolades including Emirates Man of the Match and was also named in this week’s NASL Team of the Week. 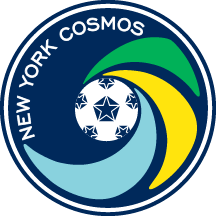 "It felt very nice to score my first goal as a Cosmos player last Saturday," said Márquez. "There is still a lot of work to do, but are confident we are heading in the right direction." The veteran midfielder joined teammates Ayoze and Daniel Szetela on the scoring list as he looks for more goals this season. Head Coach and Sporting Director, Giovanni Savarese spoke after the match about the midfielders great ability for the team as he is finding his form at the club. “He showed a lot of great things beyond scoring a goal, he was in the fluidity of play, found spaces going forward and shows he’s a quality player,” Savarese said. With plenty more expected from the seasoned midfielder this season, Márquez will look to deliver another outstanding performance on Saturday night when the Cosmos face San Francisco Deltas at Kezar Stadium at 10:00 pm.